BUPeriod is a lifestyle company to empower women through menstrual health. 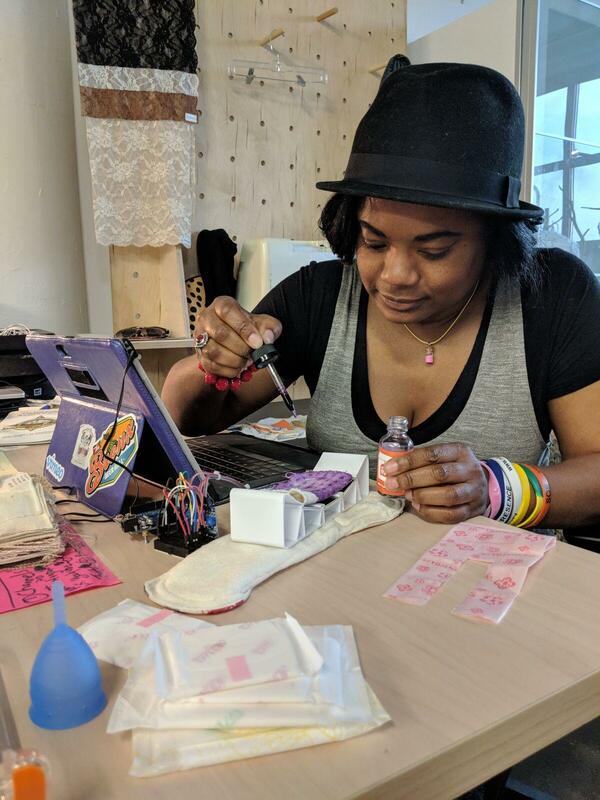 The winner of our recent Make It in Brooklyn Female Founders pitch contest, BUPeriod will design sustainable and innovative smart sanitary pad solutions for women who have issues with menstrual health management. We caught up with founder, Vanessa Siverls, to find out what’s been happening with BUPeriod and what’s next for the startup. DBP: Tell me about BUPeriod and why did you start this company? Vanessa: In April 2015 doctors removed 22 Fibroids from my uterus that caused heavy flow during my period cycle. There were no pads that were safe and effective for my needs to manage. I quickly realized I wasn’t alone. 14% of all women in the US with Fibroids have symptoms that requires more customization for their MHM needs. It was during recovery from surgery that I decided I wanted to help women like me— women who needed a space in menstrual health and a space on the pharmacy shelf! I wanted to create a product where women felt it was okay to just be themselves, regardless of their menstrual circumstances. Period. DBP: How did you feel when the judges announced BUPeriod as the winner of the Make it in Brooklyn Female Founders pitch contest? Vanessa: I felt blown away when the judges announced BUPeriod as the MIB winner. This was a first time win for us. We’ve done four pitches…so it’s still pretty early…which is why I was shocked. It felt good from the standpoint that I was able to sell the vision. DBP: How do you plan to use the $5,000 cash prize to help or advance your business? Vanessa: I plan to use the $5,000 to finish paying trademarking, patent fees & balances, engineer contract fees, balance of prototyping materials, website enhancement & development, crowdfunding development, and in addition, 10% donated to menstrual health and fibroid awareness nonprofits, 10% savings, 10% invested into BUPeriod branded marketplace for fundraising strategy. DBP: How will the in-kind legal services provided by Brooklyn Law School, and one month’s free residency at NYU Tandon’s Future Lab, benefit BUPeriod? Vanessa: The in-kind legal services provided by Brooklyn Law School will be an amazing resource for my patent process. This is a golden opportunity that can cost a startup, especially early stage, a lot in fees. In addition, having an opportunity to reside at a NYU Future Lab for a month will definitely expand my exposure to more talent and resources in the field of Data Science and AI. The end goal of the SmartPad product is to incorporate IoT to ensure we are in line with trends of technology, communication and globalization. DBP: Why is Brooklyn a great place to do business for your startup? social impact such as IFP, Futureworks, 1776, Electrospective, and Brooklyn Fashion & Design Accelerator, just to name a few. DBP: Why did you choose to start your business in Brooklyn, and, can you speak to why Brooklyn is a great place for a startup to do business? iconic skyline views of Manhattan and it is America’s Brownstone haven! DBP: What are the challenges of being a female tech entrepreneur in a traditionally male-dominated field (i.e. tech)? Vanessa: I believe some of the challenges of being a female entrepreneur in tech are navigation, communication and customization. Meaning, there is a specific flow and movement that I discovered existed in traditional male dominated fields. I used to work at the National Football League, so I am used to observing that flow of male energy. It is quick, impulsive and free of fear to jump. There is a sense of “This is gonna work. This didn’t work. Lets try it like this to make it work.” My female instinct was to be a bit more calculated, detailed oriented and structured which was sometimes met with tension due to time constraints. But if I didn’t speak the language, not just verbal but body as well, I found it difficult to add that type of value that I knew I had for creativity and problem solving. I soon discovered that I was unique and needed a custom approach to getting started in any vision that I had for myself. You can’t fit a circle in a square and vice versa. Acknowledging and identifying the gaps of diversity and inclusion in the tech and funding opportunities is a great first step to evening out the playing field. Customizing opportunities for minorities in this field, such as the MIIB pitch competition, or Women’s Entrepreneurial Bootcamp with Davis Wright Tremaine, and more specific targets such as The New Voices Fund for women of color to get funded for their startups, is a major second step. Turning challenges into opportunities to customize your path to entrepreneurship, especially in tech, can prove to be the road of least resistance which leaves more room for creativity, problem solving and most importantly pipelining the next generation of female entrepreneurs. DBP: Are there any ways that being a woman has been an advantage to you or your company ‘making it’ in the tech sector? Vanessa: Well I’m still just getting started on my journey to “making it”. So I just focus on “making”. I believe my unique value proposition is being a woman and will set me apart for entry into the market. In my opinion, being a woman in a mostly male dominated industry or field is always an huge opportunity to stand out, have fun at being unique, identify gaps that men may not be privy to and can potentially put you at a competitive advantage in an exciting and organic way. DBP: Anything else you’d like to add? Learn more about BUPeriod and read about their recent win at our Female Founders pitch contest here.